This was my other option for this week's CASology Cue Card - Star. Similar in some ways to the one I actually posted in the challenge, but a lot more stars. I wasn't sure it was CAS enough, but I do like it! I drew the lines with pencil before stamping the stars, then adding the black lines in Copic Multiliner. 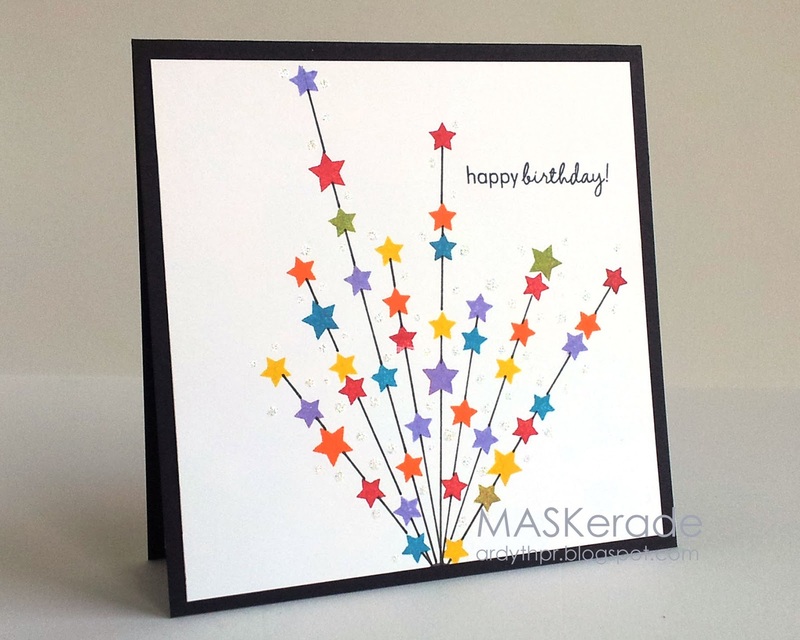 There are spots of Stickles, to add sparkle. I hope you'll play along this week! Don't forget the deadline is Sunday at noon (CST). It's CAS and awesome...love it! It's CAS enough for me! Merry Christmas! This is the most fantastic birthday card! I love the bright colors and the movement you created with the stars. Love those shooting stars, Ardyth! No choosing I love them both Ardyth! How fun to have a fireworks display of shooting stars on a birthday card! Perfect!! So totally clean & simple and absolutely perfect for this cue card! Love the colors! LOVE this card! It's a "case" for sure! The design and all those wonderful stars are just great! :) This will make a great New Year's card. TFS! wow. This is so neat and creative! I love it! You get such great coverage on your solid stars, they looked like punched shapes to me. Love how happy this is. Reminds me of your snowflake design, how you drew lines to make your focal point. And, you put the sentiment in the perfect spot ... the gap between the red and orange star ... such great design! !